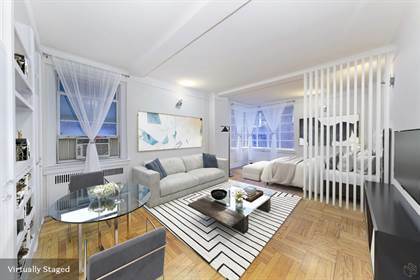 Rarely available Pre-war Condo studio in a Boutique Art Deco building right off Park Avenue. This building requires no Board Approval, and allows unlimited subletting. This spacious corner unit is over 500sf with two exposures. It's loaded with pre-war details - 9' beamed ceilings, bordered herringbone wood floors, moldings, and casement windows. The windowed kitchen has been renovated with stone counter-tops, wood cabinetry, and stainless steel appliances. The bath has been renovated as well with keeping it's prewar character in mind. The apartment has exceptional closet space for a studio (four closets) and also enjoys a dressing room. 110 East 87th Street is a full service condominium in a fantastic up-scale Carnegie Hill location - convenient to all major transportation (Q line, 6 line, 86th St. Crosstown), Central Park, great food markets (Whole Foods, Fairway) movie theaters and Museum Mile. Pets, Pied-a-Terres, Investors, subletting are all allowed. Hi, I'd like to find out more information about 110 East 87th Street. Thanks so much!